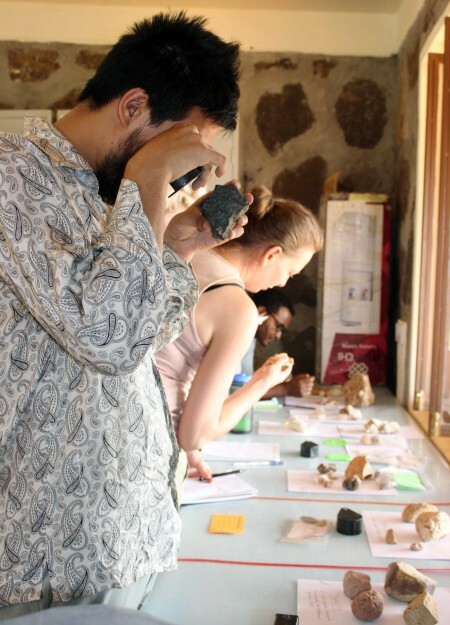 So far in the field school we have learned all about the modern local environment and the history of life in the areas surrounding Ileret. But how do we measure this great depth of time? How can we know why and how the environments changed and the effects on the life they sustained over time? 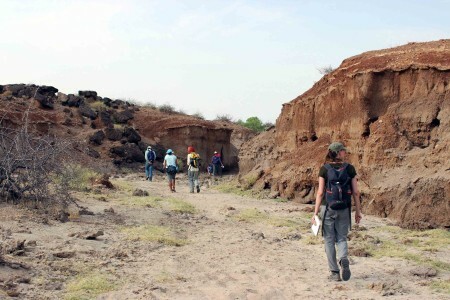 Prof. Craig Feibel is renowned for his expertise on the geology and past environments of the Turkana basin. 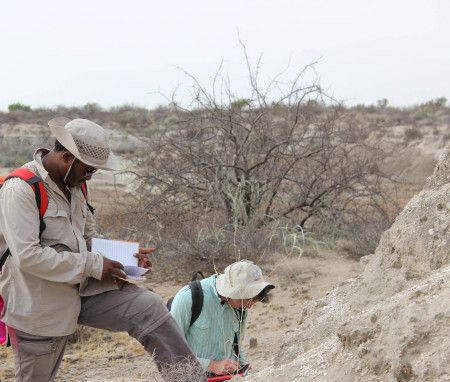 Prof. Feibel’s research focuses on the geological context for evolution in terrestrial ecosystems, relating these data to the story of human evolution. 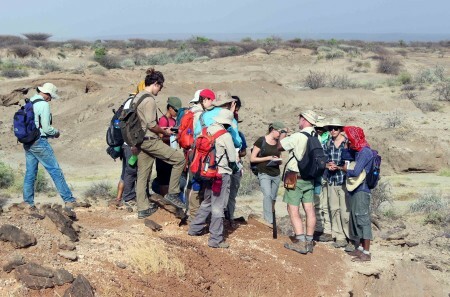 We at the TBI Field School are privileged to learn about the geological history of the Turkana basin from Prof. Feibel in the field, right here where it all took place. 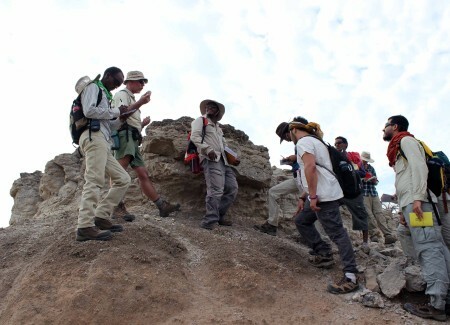 Before getting into the nitty gritty of the geological history and past environments around Ileret, Prof. Feibel oriented the students to their surroundings with an instructive “geo-walk”. 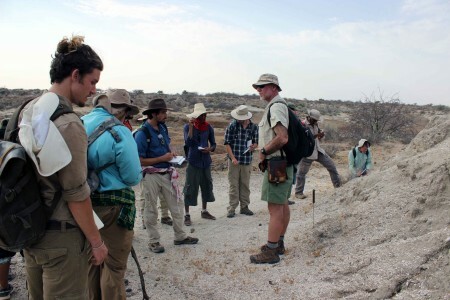 Hiking through different sediments, river channels and outcrops, Prof. Feibel showed students some geological basics for the area surrounding Ileret. A view over an area just a short hike away from TBI Ileret camp. This place has a lot of features that are informative about the basics of geology in this region. First stop on the geo-walk is the “main fish bed” layer. As the name indicates, these sediments are filled with fish fossils from an ancient lakebed. The key to finding this special layer is to look for red, muddy clay sediments. If you look just below this red sediment layer, you will find some whitish deposits containing a lot of carbonates and below that, a hard sandstone layer. The fish fossils are found just between the red sediments and the sandstone layers. 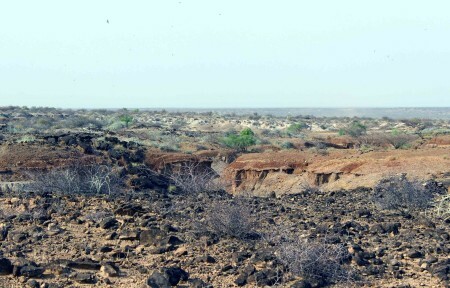 Geologists have determined the age of this layer by finding its position just between the Ileret (1.53 Mya) and Chari (1.38 May) tuffs, the estimate is that this lakebed is approximately 1.49 Mya. So, if you find this layer, you can get a rough idea of the relative ages of surrounding sediment layers. Prof. Feibel shows TBI students how to identify the “main fish bed” layer. The main fish bed is very useful in this region to understand where you are in geologic time. You can’t tell a book from its cover. Even though the sandstone layers look black on the outside, they are actually light in color. The black coating is made by cryptogams – tiny organisms living on the rocks surface giving them a black appearance. Are these rocks really black? From the sky they look like black volcanics, but if you take a closer look and break them open, they are actually very light in color. 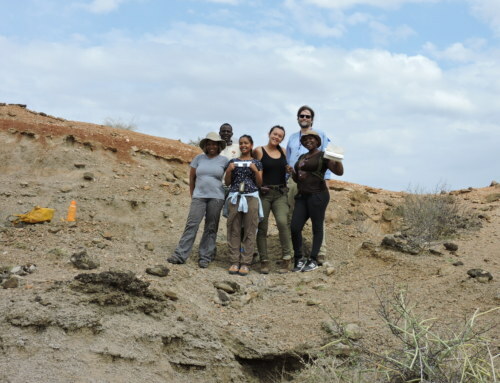 Prof. Feibel led us down into a dried riverbed to check out a good view of the sediment layers that built up over time. These channels carve winding paths through the ground, revealing sections of sediment layers that can tell us a lot about the past environments of this area. The area around Ileret is very arid, and the majority of rivers do not run year round. These riverbeds are usually dry, but fill up very quickly during the wet, rainy season. Rivers move huge amounts of sediment around and through the landscape, sometimes impacting a lot of change. Walking through the dried riverbed to look at the layers of sediment. Stopping at a good section of the riverbed wall, Prof. Feibel points out some special features that are telling of the past environment. That thin line near the top of the section is made of the sandstone I mentioned earlier, and on top is the red sediment layer. We know that this part of the section contains the main fish bed – if you look closely, you can see a dip in the lightly colored line. This dip indicates an ancient fish nest – where the fish dug down into the lakebed sediment and deposited their eggs. Can you see the differences between the layers in color and texture? Can you see the dip at the top? That’s an ancient fish nest! There isn’t a lake where we walked today, but the fish bed layer and fish nests show there once was a lake covering this ground. Below the fish bed layer, the sediments tell a different story. 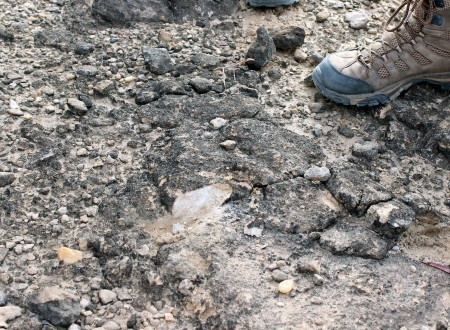 The nature of these sediments and their contents – fossilized roots called rhizoliths and other carbonate nodules – indicate that they were terrestrial soils. Prof. Feibel noted these features, and told us the story of changing environments in this area. The environment fluctuated from very high lake levels, covering very large areas – and dropped in lake level, revealing sediments and supporting terrestrial life. This one spot would have looked very different at several different times throughout the millions of years we can see in just this one section of sediment. 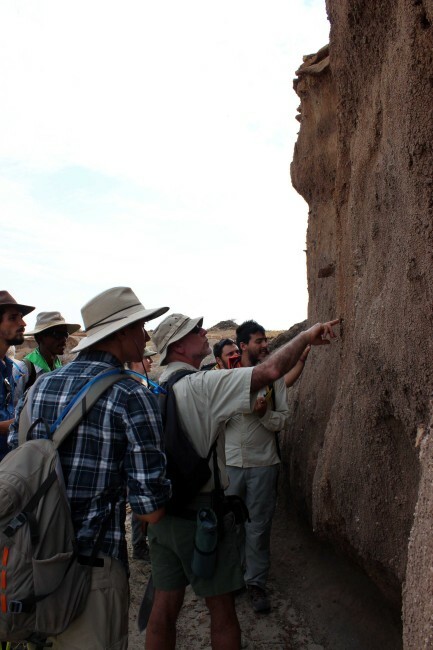 Prof. Feibel points out some features indicating this layer is made of soil – meaning at this point in time the area was terrestrial, not underneath lake. 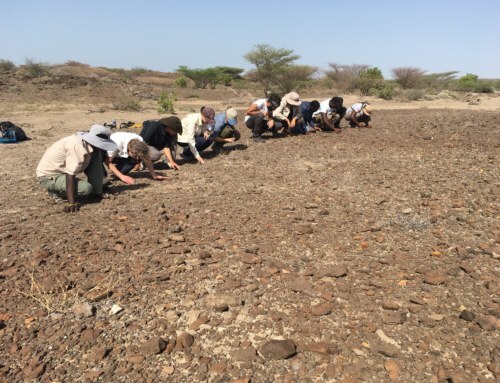 Moving forward in time – and on the hike – Prof. Feibel stops at a section of sediments called the “Galana Boi member”. These deposits are only as old as approximately 12,000 years ago. It was amazing to step from one layer of sandstone to the Galana Boi, two layers representing over a million years of time. Sometimes we are fixated on how the land looks today and its hard to imagine anything different. But the story of the land here at Ileret is a complicated one, and in different stages this place would have been almost unrecognizable to us. Many forces – water, climate, wind, and volcanic activity – caused drastic changes in the composition and shape of this landscape. Geologists piece this story together, layer by layer, looking for clues indicating which of these past processes were in play and their effects on the landscape. Prof. Feibel shows the TBI students the Galana Boi member. Tadele records the specific features of this member – most notably the little marine shells. The final stop on our geo-walk was the Chari tuff. A ‘tuff’ is a layer of volcanic ash that settled after an eruption. Clocking in at around 1.38 million years, the Chari tuff deposit is among the youngest of volcanic ash layers in the area. A tuff layer is very light and dusty in weight and texture. It feels just as it sounds it should – very light and ashy. 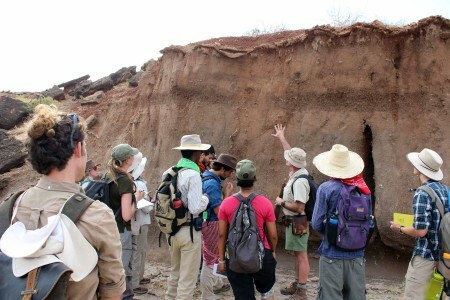 Prof. Feibel shows the students the Chari tuff. 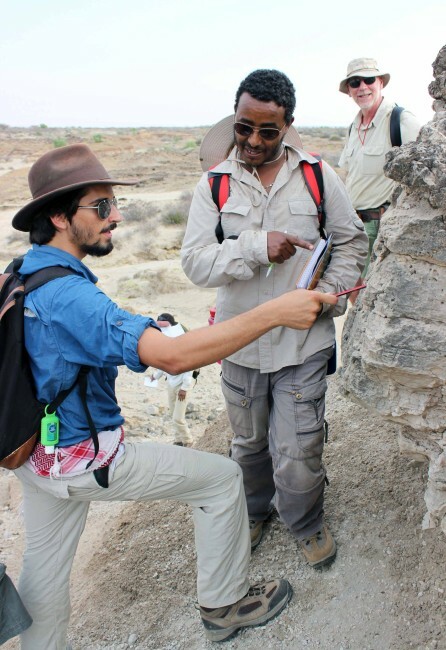 Tadele and Evan discuss the features that indicate this layer is made of volcanic ash. 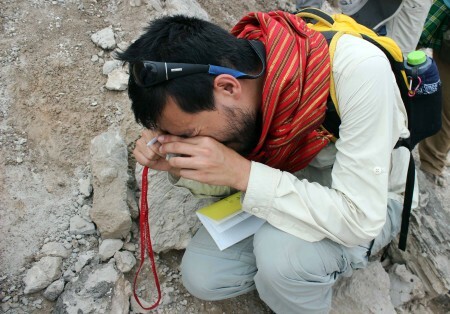 Ryan uses a hand lens to look closely at the glass particles in the tuff. If you look very closely at a piece of the tuff, you can see little specs of glass. These particles have a specific composition, and scientists have been able to use these signatures as fingerprints. 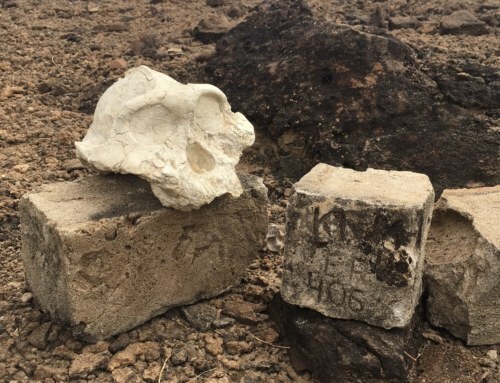 These also trap energy and scientists have figured out a way to use this composition as a clock, indicating the date of the eruption. Porous and relatively light-weight rocks called pumices are usually found in association with these tuff layers. Pumices are also products of volcanic eruptions. The porousness was created by gasses released in the eruption process. Pumices are often found in association with tuff layers as they are other products of volcanic activity. 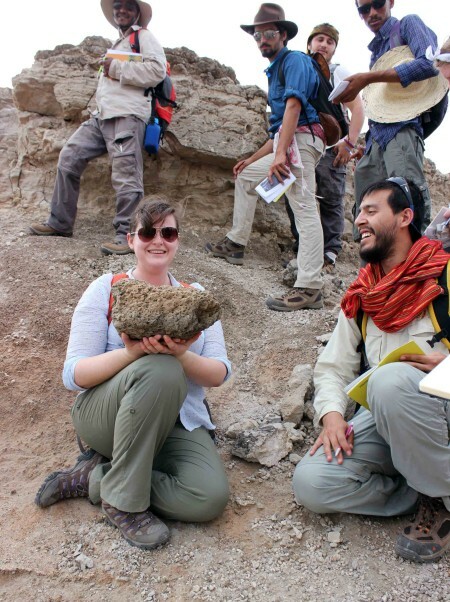 Hilary notices a rather large pumice, and is happy to haul it back to camp for some much needed foot scrubbing. Back at the labs…Prof. Feibel introduces students to the many different types of rocks and minerals found within the area. These include the broad categories of minerals (such as calcite and sulfur), metamorphic rocks (such as gneiss), igneous rocks (such as basalt), and sedimentary rocks (such as sandstone). Students learned about all of the different processes that form these rocks and minerals, which is why they are placed in different categories. Prof. Feibel gives a lecture about the structure of different types of rocks, followed by some hands-on lab time with the samples. 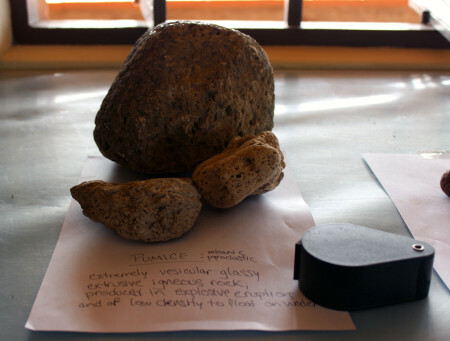 A sample of pumice from locations around Ileret. 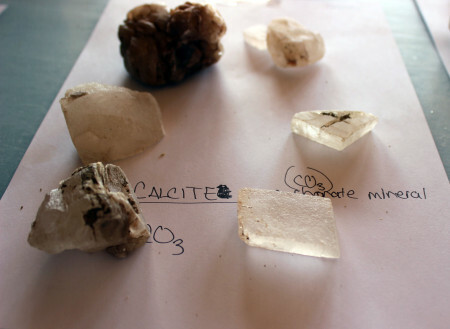 Samples of locally sourced calcite minerals. The students get up close and personal with different types of rocks. They need to know them well in the lab so that they can identify them properly in the field. 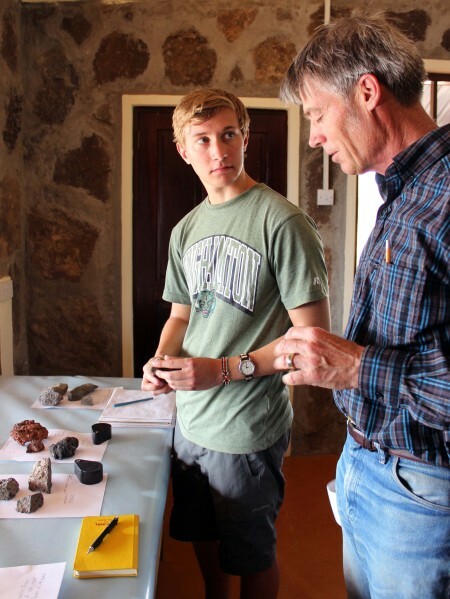 Bob Raynolds helps Rob figure out some of the different metamorphic rocks found in areas around Ileret. 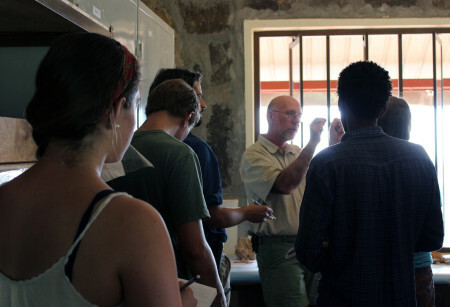 Dr. Bob Raynolds, consulting geologist and research associate at the Denver Museum of Nature & Science kindly shared his expertise on Turkana basin geology with the students. 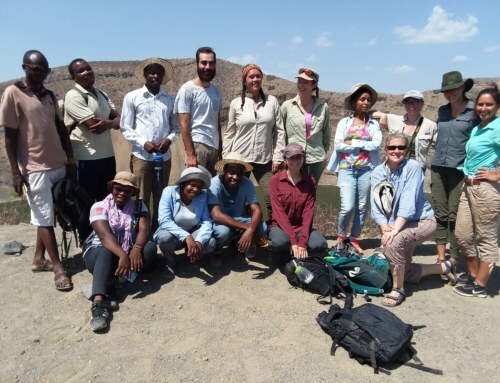 Dr. Raynolds has a long history of research in the Turkana Basin (as well as many other areas of the world), and is a wealth of knowledge for the TBI students in this geology module. 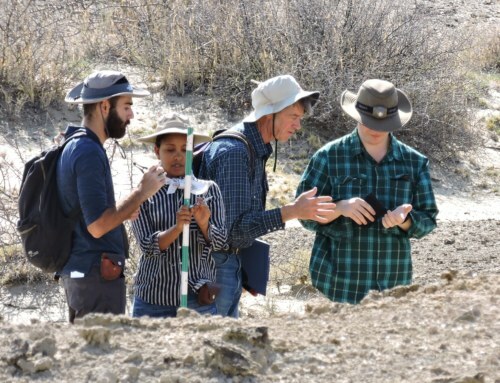 After learning about some basic geological processes and how to identify the different types of rocks, minerals and sediments in the local area, students were prepared to head out into the field for mapping, measuring and section drawing.